The Second Reading this weekend is taken from the last book of the Bible, the Book of Revelation. John was just a young man when Jesus rose from the Dead, but in the second reading John is now a very old man exiled on the tiny Greek Island of Patmos, which was probably where the government sent criminals to die. All his other brother Apostles had been martyred, and the Virgin Mary whom he lived with for many years had years before been assumed into Heaven. It was there on Patmos one Lord’s Day, which is Sunday, that John was caught up in Spirit and is given a vision of seven gold lampstands, and in the midst of the lampstands was the Risen Lord Jesus. Seeing Jesus amidst the Lampstands on the Lord’s Day, John fell down at Christ’s Pierced Feet, as one dead to the world, and alive only for Jesus. This passage is the reason why Catholic Altars traditionally have six big gold candlesticks with an Altar Crucifix in the middle of them, like our altar does, to represent these seven lampstands that John saw in His vision. 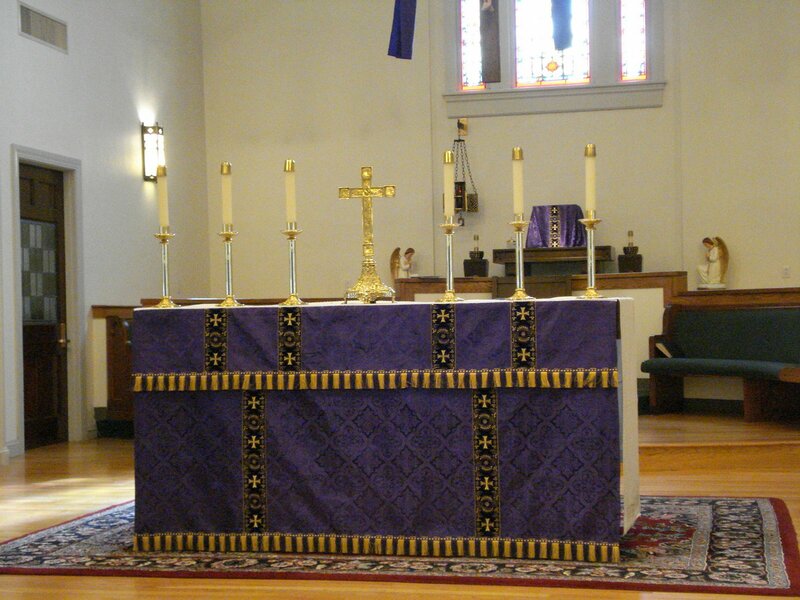 Just like John’s vision, on the Lord’s Day, on Sunday, when we come to Church, the Risen Jesus, Body Blood, Soul and Divinity, appears in the midst of the Seven Lampstands on our Altar. May we too like John fall down before Him, dead to the world and alive only for Jesus. While we see Jesus at Mass hidden under the species of Bread and Wine, John in His Vision saw Him as He really looks like in Heaven, wearing an ankle length robe, with a gold sash around his chest. In this respect, John’s vision of Jesus is very similar to the Private Revelation the Polish Nun St. Faustina Kowalska had of Jesus on February 22, 1931. (That) evening, when I was in my cell, I saw the Lord Jesus clothed in a white garment. One hand (was ) raised in the gesture of blessing, the other was touching the garment at the breast. From beneath the garment, slightly drawn aside at the breast, there were emanating two large rays, one red, the other pale. “After a while, Jesus said to me, “Paint an image according to the pattern you see, with the signature: Jesus I trust in You. I desire that this image be venerated, first in your chapel and (then) throughout the world. Just as Jesus told John to write down the vision he saw on a scroll, for the world to read, so Jesus told St. Faustina to paint the Vision she saw, for the world to Venerate. All of this is private Revelation and we’re not required to believe Jesus really appeared to St. Faustina, still it is amazing that this Polish nun who died in 1938 was absolutely correct in prophesying that this Divine Mercy image of Jesus would be venerated throughout the world, and that this Sunday would become officially known as Mercy Sunday, which became a reality in 2000 by decree of Pope John Paul II. The Divine Mercy image and devotions surrounding the image such as the Chaplet of Divine Mercy have become so popular because it’s message is much needed in our world today. Jesus gave the Church in the modern world this consoling image to heal the wounds of this past 20th Century, a century of widespread atheism, unbelief, a century of unprecedented violence and hatred, a century which saw the Jewish Holocaust, the Russian Gulag, the Armenian and Rwandan Genocide, legalized abortion, abuse of children and many other atrocities. Admonishing sinners, bearing wrongs patiently, forgiving offenses willingly, comforting the sorrowful, and praying for the living and the dead. Jesus we trust in you, may this image of Divine Mercy truly be written in our hearts and lives. Et sedens, docebat de navicula turbas. This image of Jesus teaching from Peter’s boat has always been viewed to be a foreshadowing of the Holy Catholic Church. For the past 2000 years, Our Lord Jesus has sat in the middle of this boat which is the Church, a boat which sails safely through the stormy waves of history, with the successor of St. Peter, the Pope, at the helm. And from this boat which is the Catholic Church, Jesus continues to teach the multitudes that are found both on and off the boat; and the multitudes down through the centuries continue to be taught by Christ in whatever waters this boat is found sailing in. And once in a while, Jesus will cease teaching for a moment, and turn to the Captain of the ship, and say to him what He said that day to St. Peter: Duc in altum. Launch out into the deep, and lower your nets for a catch. A few years ago, our beloved Holy Father Pope John Paul II went home to the Lord, and the Cardinals in conclave elected Joseph Cardinal Ratzinger to succeed him as Pope. And taking the name Benedict XVI, he became the vicar of Christ, the successor of St. Peter, the captain of the S.S. Catholic Church. And so our great Captain, Pope Benedict, obedient to the Lord’s voice, went and got that 900 year old net which is the Traditional Latin Mass. And on July 7th, 2007 he sent out a letter to all the Fishers of Men in the Church today, the Priests of the Church. And in this letter, this Motu Proprio Summorum Pontificum, the successor of Peter said that beginning September 14th, 2007, the Church was launching out into the deep, and lowering the nets for a catch, and that any validly ordained Fisher of Men of the Roman Rite who wished to had permission to use the older net instead of the newer one, and no one could tell him he wasn’t allowed to. And over the past nine months since the implementation of Summorum Pontificum, we are seeing in more and more Parishes and Chapels around the country and around the world the older net being used by more and more priests. And also over the past nine months, we are seeing more and more fish getting hooked by the beauty, the reverence, the mystery, and the majesty of this Extraordinary Form of Mass. In the opinion of not a few Master Fishers of Men, the older net can go down much further into the depths than the newer one can, which enables it to catch some prize fishes that the newer one can’t hook. Many also feel that the Traditional Latin Mass is able to reach further into the depths of our being: the silence, the rituals, the Latin prayers allow us to leave the shallowness of this fallen world and to plunge deep into the world of the spirit, deep into the unfathomable mystery of the Thrice Holy Trinity. Certainly in a well celebrated Traditional Latin Mass reverently entered into, Jesus is capable of bringing us to our knees as he brought Peter to his knees after the miraculous catch of fish. Here we encounter the Holiness of Christ, and beg Jesus to depart from us, for we are sinful men and women, O Lord. One of the most popular novels of the 20th century is J. R. R. Tolkien’s The Lord of the Rings Trilogy. The three volume work was also made into three movies several years ago, which were all in large part faithful to the original books. One of the many amazing things about The Lord of the Rings is that while whole books have been written showing how almost every aspect of the Catholic Faith can be found in the work, in the 1200 plus pages of the Trilogy itself, Tolkien mentions God by name only once, and even then, most people don’t even realize he’s referring to God in the passage. I bring this up today, not because I’m a huge J.R.R. Tolkien fan (which is certainly the case), but because that one time Tolkien does mention God in his book, it is God the Holy Spirit that he refers to. “I am the Servant of the Secret Fire” says Gandalf to the Balrog down in the Mines of Moria, towards the end of Part I, the Fellowship of the Ring, in case you’re wondering just where in the book or movies it is. After the book was finished, Tolkien was asked what the “Secret Fire” was, and he said It is the Holy Spirit. “Secret Fire” is a wonderful way to think of the Holy Spirit. From the creation of the world up until the time of Moses, the “Secret Fire” who is the Holy Spirit was kept well hidden in the bosom of the Holy Trinity. But in the Old Testament, every now and then glimpses of the Secret Fire could be partly seen, hidden in the voice of the Old Testament Prophets. Throughout Our Lord’s life, this Secret Fire would at times flame out, as Jesus worked miracles and taught with authority and healed the sick and expelled demons. But at other times the Secret Fire would stay secret, as He did the first 30 years of Jesus’ life, as He did during Jesus’ Passion and Death and Burial. But at the Resurrection, and even more so at the Ascension, the Secret Fire who is the Holy Spirit was least secret in showing the faithful just what it was fully capable of doing in raising Christ from the dead, and setting Him on the Throne at the Father’s right hand high. And Today, Fifty Days after Christ’s Resurrection, Jesus sends this very same Secret Fire that He carried in this world, into the heart of every Baptized believer in Him. And it’s by this tremendous grace of Pentecost that you and I are now “Servants of the Secret Fire,” Servants of the Holy Spirit who now dwells in us the same way He dwelt in Christ. Throughout His earthly life, Jesus was led by the Holy Spirit, and was totally obedient to the Holy Spirit’s guidance, both in ordinary things and in extraordinary things. And you and I should also be led by the Holy Spirit, and be obedient to His promptings, both in our every day life, and in the exceptional times when we face big trials or decisions. As we celebrate this Great Feast of Pentecost, which to the Church is on a par with Christmas and Easter, may we ask the Holy Spirit to be that Secret Fire within us whom we serve, who will warm and brighten our hearts and our Church, no matter how cold and dark the world around us may get, and who will also at times flame out of us and out of the Church, to renew the face of the earth. You are currently browsing the archives for the Traditional Latin Mass Homilies NEW!!! category.